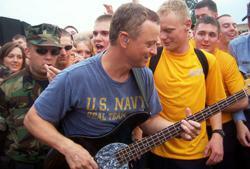 Gary Sinise Teams Up with the USO and Loyal Studios to Provide Entertainment for the Last Troops to Leave Iraq. The Gary Sinise Foundation heads to Kuwait to help and entertain the remaining troops. Camera support and technical equipment was provided by Loyal Studios to help the cause. There were approximately 180,000 troops still in Iraq when the decision was made to get them home by Christmas 2011. Many did return before the deadline, but due to the incredible logistical challenge, about 40,000 are still in Kuwait waiting to return to their families. It is these men and women that Gary Sinise and his group will go to visit and entertain with the help of the USO and producer Jake Radamacher, who will document the busy itinerary with cameras and technical support from Loyal Studios. Academy Award nominee, Gary Sinise – best known for his portrayal of war hero, Lt. Dan Taylor, in the iconic 1994 film “Forrest Gump” as well as his dynamic recurring role on CSI: NY, – formed the Gary Sinise Foundation in 2010. The Foundation has devoted a significant amount of time and investment to support our military both at home and overseas. From his concerts with his band, Lt. Dan’s band, to his taking time out of a very demanding production schedule to meet with soldiers, his efforts focus on boosting morale and honoring our troops. The feedback has been remarkable. The last of American troops moving out of Iraq after the decade long war are now waiting in Kuwait to start their journey home. After multiple tours, they look forward to seeing their loved ones again as celebrated, valiant men and women of the armed forces. “We have worked closely with Gary on the documentary, Brothers at War, which tells the story of my family and their experiences in Iraq as well as the challenges they faced at home,” Rademacher said. The Gary Sinise Foundation is a non-profit organization devoted to the support and recognition of our troops.